Delhi normally receives the monsoon rain between June 28 and July 1. There is still an entire week to go and the heat in the capital is at its peak. There is also unusual local heating in certain parts of the city which is largely owing to the construction activity as well as removal and dislocation of some of the green cover. The use and sale of ACs is high and mineral bottles are selling also because they are an easy access to cold water. The effect of the scorching effect has also added considerable pressure on the city’s water supply as several areas are getting only intermittent supply of water. Water bodies such as Sultanpur National Park are already making headlines owing to water shortage. The highest maximum temperature recorded in the last 24 hours was recorded at Sri Ganganagar (Rajasthan) at 48.1° C.
According to Dr. Ajit Tyagi, Director General, India Meteorological Department, the ‘Phet’ cyclone blowing in the Arabian sea, and ‘Laila; that lashed the eastern coast late last month, have not made the weather department revise their forecast for the June-to-September monsoon. South-west monsoon normally sets in over Kerala around 1 June. This year, in association with the strengthening and deepening of lower level westerlies and persistent widespread rainfall over the region, southwest monsoon advanced into most parts of South Arabian Sea, entire Kerala, south Tamil Nadu and some more parts of South-western states, West Bengal and Sikkim on 2nd June. However, the formation of cyclonic storm ‘Phet’ caused a disruption in the flow pattern, resulting in a temporary stagnation in the further advance of monsoon over peninsular India. 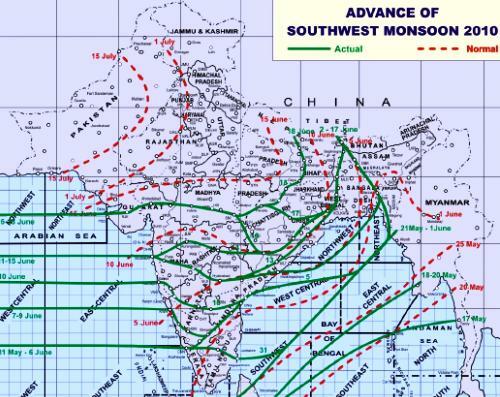 The monsoon has now already advanced after the temporary stagnation. The cumulative seasonal rainfall for the country as a whole during this year’s monsoon upto 17th June has been 3% below the Long Period Average (LPA). Out of 36 meteorological subdivisions, the rainfall has been excess over 11, normal over 12 and deficient /scanty over 13 subdivisions. According to the meteorological Department, temporary weakening of the monsoon current is likely during the coming week with subdued rainfall activity over most parts of country except along the west coast (Konkan & Goa, Coastal Karnataka) and over northeastern States. No major advance of southwest monsoon has been predicted over eastern and central India during the next one week. One can only hope that the rain gods bless Delhi with some relief from the scorching heat soon! Let’s hope it comes soon; the heat is definitely rising.